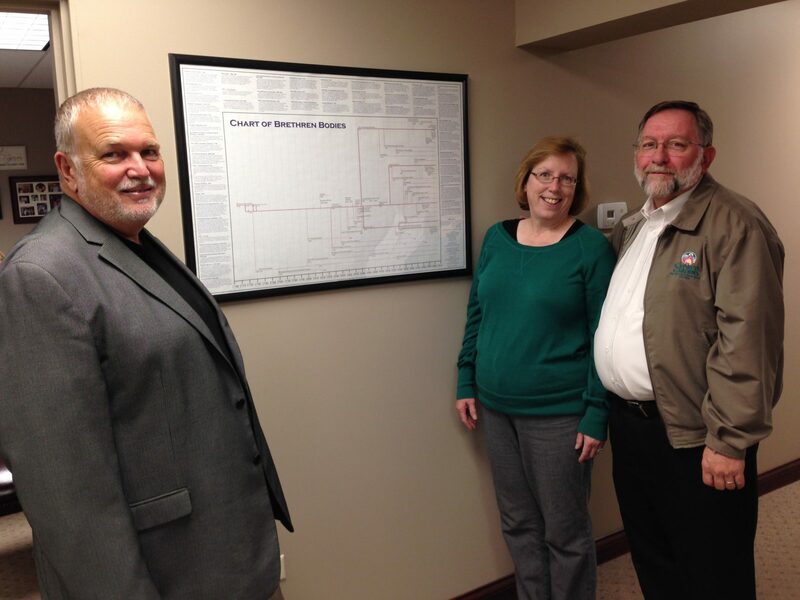 Pastor Reid and Terri Firestone, from the Grace Brethren Church in Homerville, Ohio, visited the FGBC offices today and checked out the “Chart of Brethren Bodies.” Also pictured is Tom Avey, FGBC Coordinator. When Reid Firestone took the pastorate of the Grace Brethren Church in Homerville, Ohio, more than a year ago, he was an experienced pastor from another denomination. Today, he and his wife, Terri, took time learn more about the Fellowship of Grace Brethren Churches with a visit to the offices of Grace Brethren organizations in Winona Lake, Ind., getting better acquainted with the people who lead them. At GraceConnect/BMH, they learned about the communications ministry of GraceConnect, took a tour of the book warehouse, and heard some of the history of the organization, which dates to 1939, from executive director Liz Cutler Gates. Tom Avey, FGBC coordinator, showed them around Winona Lake. Stops also included time with: Dr. Jeff Gill, Grace Theological Seminary; Tom Julien, Encompass World Partners; Ken Seyfert, Grace Brethren Investment Foundation; and Ed Lewis and Timothy (TK) Kurtaneck, CE National. They will also be attending the Super Wednesday program tomorrow at CE National. Avey encourages pastors to visit Winona Lake to become better acquainted with the ministries of the Fellowship of Grace Brethren Churches. Many of the organizations are headquartered in the community, making it easy to have personal appointments with many of the leaders.